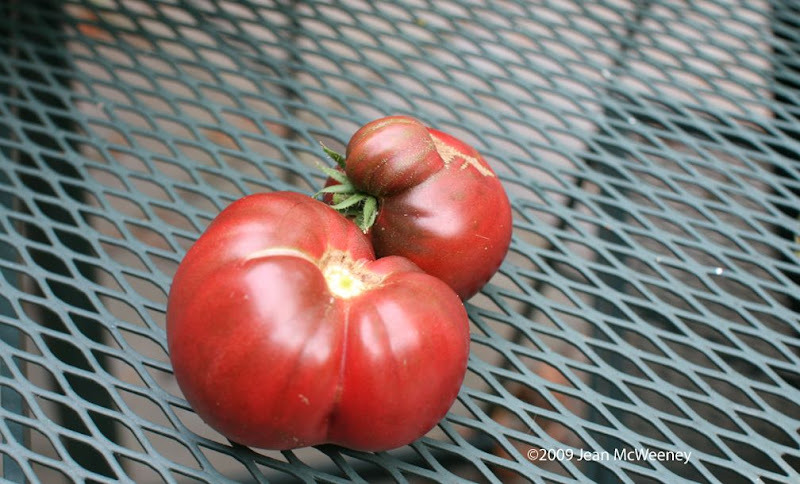 Hybrid vs. heirloom, what's wrong with having both? This year I decided to try tomatoes in pots. I meant to have just one plant but I couldn't help myself. I was unsure of how much fruit I would get off my one heirloom, Cherokee Purple, and isn't it fun to eat little cherry tomatoes as you're working in the garden? So I succumbed to temptation and bought a cherry tomato plant too, Sweet Million (I'm assuming it's hybridized off the Sweet 100 but am not sure). So here's a snapshot showing my Cherokee Purple plant. It's in a "self-watering" container (you have to put the water in a little spout). The kit also came with organic potting soil and organic fertilizer. It said you could put two tomato plants in it but I used my better judgement and went with just one. Am I glad I did! I'm now to the point where I have to decide whether to start cutting it back at the top. Some folks say that sacrifices flavor. But one big windstorm might topple the whole thing and then I'd be sacrificing all of them (although it seems very heavy so I'm hoping not). So what about my hybrid Sweet Million? Well, it didn't come with organic soil and fertilizer but I put it in a good size pot, added some Ladybug organic potting mix and shared some of the C. Purple's fertilizer with it. The plant was a little leggy when I bought it but I pinched it back. I also gave it the same light conditions. Hmm, doesn't look so good, does it? I've had a few cherries off it and they tasted okay. Not as sweet and thin-skinned as the Sun Gold cherry tomatoes I grew for the last two years but not bad really. But the plant looks pathetic! So what did I do wrong? I really don't know. From just looking at it you might think it has spider mites or something but it doesn't. Any ideas? I think this plant will be heading for the compost pile within a month. Shape up or ship out I say! I leave you with Cherokee Purple tomatoes #'s 2 and 3 for the season. And there's two more to pick tomorrow before we head out of town! Did you have Tomato Horn Worms? If not do you use something to prevent it? I am a first time gardnener and I found 3 on my tomato plant yesterday morning and boy are they fiesty. Tomatoes already? That's just not right. Jean, I too, planted some heirloom tomatoes. My first ever. We'll see if the taste is THAT different – in August! Jean, those are some nice looking Cherokee Purples. I haven't tried heirlooms in years. Maybe this fall I'll see if I can get one to grow. I have a credit at Gardeners' Supply to use: one of those self-watering pots might be just the thing! I'd say that self-watering container and the organic potting soil and fertilizer is working. Quite impressive. Don't know what to say about the cherry tomato plant except, I'm sorry. Your Cherokee Purple looks really good. 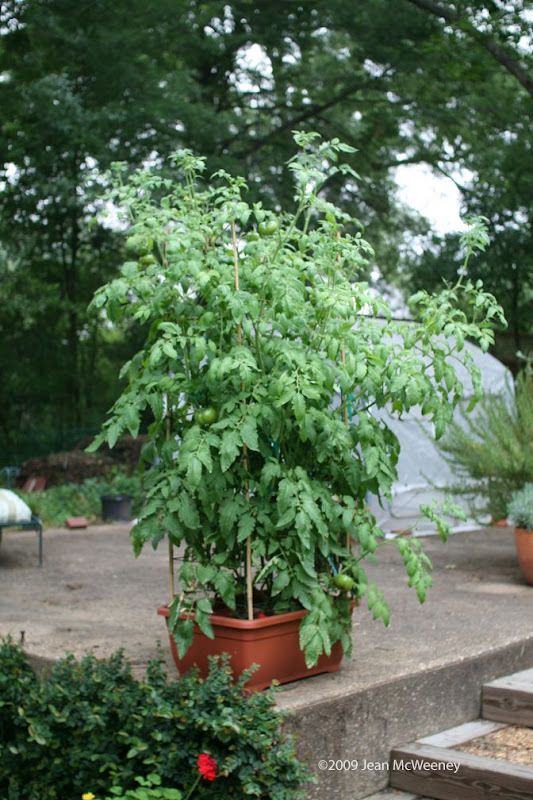 We have always grown our tomatoes in containers with good results. This year we planted Patio and Husky Cherry Red tomatoes. We have certainly enjoyed them in this last week. I too am having tomato envy. At 7300' feet we have a very, very short growing season. So, this year my husband and older son built me some raised beds for my veggies. We used PVC pipes to make the hoops, and I still have plastic sheeting over them to keep them warm at night. I started them from seed at the beginning of April. My choices were Sasha's Altai from Siberia, 59 days; Yellow Pear, 75 days which is pushing it; and a selection of cherry tomatoes from Botanical Interests called "Cherry Rainbow Blend" which includes Sundrop (orange), Miribelle (yellow), Brown Cherry (brown), Sugar Sweetie (red), Green Grape (green), Super Snow White (creamy white), and Bi Color Cherry (red/yellow), 65 days. We will see how it goes. I will hope for tomato plants that look as good as your first one! Jean, Maybe you could let the soil dry out a bit more before watering. Let it get thirsty for a few days, then give it a medium amount of water. Then let it dry out again. Just a thought without knowing too much about what's been going on with it. Worst case, you start over again. You still have time. 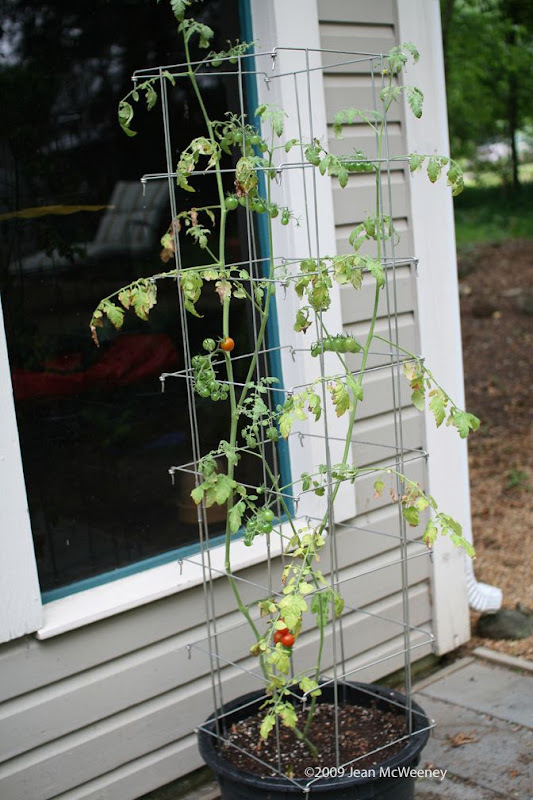 That is an impressive tomato plant in the top photo. What fertilizers did you use?Compost? This is my first year of trying to grow tomatoes – will need to keep this blog and refer back to it. I do love this site, so great to just click the mouse and get so much free info! Norm here. GetCalhoun.com in northeast Alabama. Anyway, for a lark I typed in "grave yard grasshopper," and vie-ola, there was your site with your pic. So, do you have a church or grave in your back yard? The ONLY place you see them here is around churches and graves. It is anecdotally universal! Black holes and Sasquatch are kinda fun, but the totally unexplored question of our times is WHY do these critters only hang out where they do? It is theological dynamite! !